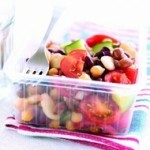 Lunch Box Tuna Bean Lettuce Salad is a quick, easy and nutritious salad recipe, that’s easily transported in a lunchbox for work or a picnic. It’s that combination of tuna, mayonnaise that we love. I am often found making up a batch of tuna mayonnaise with either capers or chopped up gherkins in it and popping it in a sandwich for Spike, my middle one. He is definitely the tuna fan! Place the eggs in a small pan, cover with water, then slowly bring to the boil. Simmer for 7 minutes, then drain. Run the eggs under cold running water, to cool. Tap the shells all over and peel away the egg shells. Cut the eggs into quarters. Cool. Blanch the beans in boiling water for 3 minutes or until just tender. Drain, rinse in cold water until cold, then drain again. 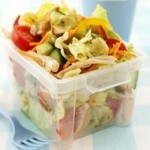 Tear the lettuce into pieces then place in a plastic container. 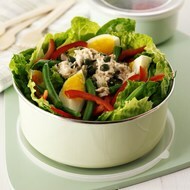 Top with pepper, capers, beans and eggs. Mash the tuna with the mayonnaise, lemon zest and juice, and salt and pepper to taste. Heap the tuna on top of the salad. Chill until required. 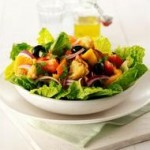 Lightly toss together before eating. 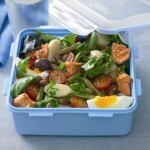 For more salad ideas or for lunch box inspiration, do check out our Recipes section.